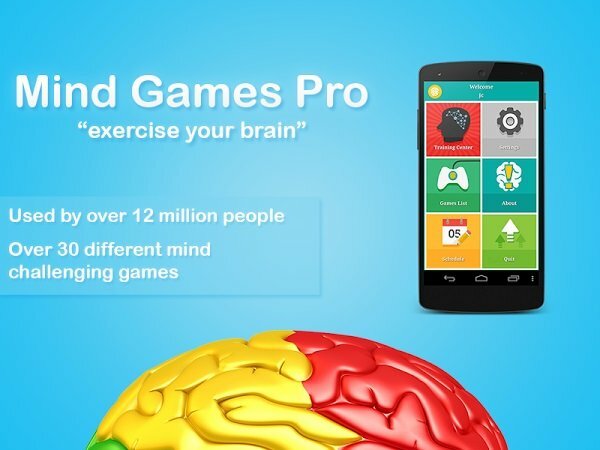 Mind Games Pro is intended to be brain challenging entertainment. No scientific research has yet been conducted to determine if this app has cognitive benefits. Many users of the app report finding it helpful and challenging as you can see in the user comments. Mind Games Pro is also available on iPhone/iPad, Windows 8.1, and Windows Phone 8. Languages available: English, Portuguese, Spanish, French, German, Arabic, Russian. Abstraction – Exercise your ability to quickly differentiate between words with a concrete vs. abstract meaning. Attention Training Game – Exercise your attention. Based on the flanker attention task. Practice your ability to ignore competing information and processing speed. Anticipation – Practice your ability to anticipate and respond rapidly. Changing Directions – Practice your attention, concentration, processing speed, and mental flexibility. Divided Attention I – Practice your ability to divide your attention and respond rapidly. Face Memory – Memorize a group of faces and then see if you can recall them. Math Star – Practice your basic arithmetic skills. Memory Racer – Practice for your brain’s working memory and processing speed. Memory Span – Practice your verbal and nonverbal working memory to increase the span of your immediate memory. Memory Flow – Practice your visual and verbal memory for the flow of events. Memory Match – Practice your memory for completed tasks. Mental Categories – Practice your processing speed and quick categorization skills. Mental Flex – Practice your cognitive flexibility and ability to ignore competing information. Path Memory – Practice your ability to memorize and reproduce paths. Serial Memory – Learn a series of 10 numbers and faces in as few trials as you can. Self-Ordered Learning for Objects – Memorize a sequence of objects using a sequence you determine. Spatial Memory – Memorize the locations of the tiles that flip over with increasing numbers of tiles. Speed Trivia – Test and improve your knowledge of general trivia and information. Vocabulary Star – Practice your vocabulary and spelling skills. Vocabulary Power – An un-timed multiple choice vocabulary task. Visual Memory – Test and practice your visual memory skills. Word Memory – Memorize 30 words and see if you can remember them. Added: Greek language support. Visual enhancements.